Tatenda Taibu is a former Zimbabwe Cricketer who is well known for his heroics against South Africa. 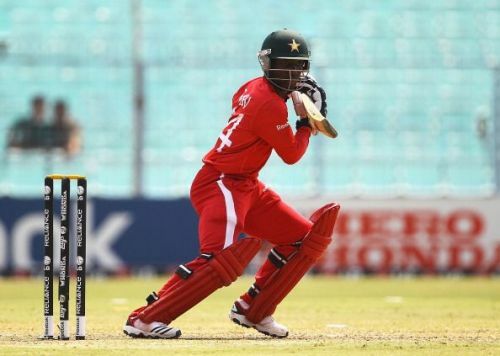 Finishing with an average of 30.31, Tatenda was one of the finest cricketers of Zimbabwe Cricket. In this interview, he talks about his favourite cricketers and also speaks about what India needs to do in order to win overseas tests. In an exclusive interview, the former Zimbabwe captain takes us down the memory lane as he talks about Sachin Tendulkar, Ricky Ponting, Adam Gilchrist, Andy Flower and MS Dhoni. Q: Hailing from Harare in Zimbabwe, how did proper cricket start for you? Please take us through your childhood. Tatenda Taibu: So, the way I started playing cricket was in PT lessons in high-density suburbs of Highfield. I grew up in a poor area and Zimbabwe Cricket had a programme to spread cricket into the high-density suburbs and my primary school was one of the schools that was picked for that programme. So, it was then we got used to that sport as a PT lesson and the coach, then a gentleman called Steven Mongongo. He would ask us to hold the bat and also throw a cricket ball and the ones that he thought were natural, were put onto the one side and they were the ones that were asked to come for afternoon practice sessions and he thought I was natural in bowling, throwing and batting and from then on that’s how I started playing cricket. Q: You made your first-class debut at a tender age of 16. What challenges did you face to get into the domestic and the national side? Did the things change from there? Tatenda Taibu: Well, it was quite a funnier story because when I started making it to the national age groups of under-12, 14, and 16 things were happening too fast for me, because when made it to the under-16 for the first time I was 1 year underage. I actually played my first First -class game when I was with the national side playing against the West Indies. So, things were happening too fast for me to realize the strides that I was actually making. And just to carry on from that to answer your other question. Of course, it’s difficult being a young boy, you are expected now to perform as a man. But, because things were happening quick for me at that time I didn’t realize, but it’s only now that I look back I realize. Q: Who was that one cricketer you looked up to while growing up? Tatenda Taibu: Well, with this question its quite funny because my role models kept changing along the way. First, it was Viv Richards because he was the first cricketer I watched on TV playing. So, one day I walked into my house and it was a black and white TV set and there was a documentary about Sir Viv Richards and I got hooked up to him because it was a cricketer being show on TV, so that was the first one. Then, along the way when I started understanding more about the game, this I’m talking when I was about 11-12 years old, I had a hardcover book which was full of pictures of Sachin Tendulkar and newspaper articles of Sachin Tendulkar and then when I started playing cricket with Andy Flower when he came to our club to join our club -it was an all-black cricket club, but Andy came to join us. So, I started seeing how Andy practised and the mental side of the game why do I have a hero from another cricketer that I don’t even know personally, one who doesn’t know I exist. Why not have a hero that I can see face to face because he was giving me tips all the time, I mean he took me as his little brother and he became my hero from then on up until I started doing well, I decided I’m not going to follow anyone but challenge myself. But, even today I respect Andy Flower for what he and has a family had done for me while growing up that I can never be able to repay what they have done for me.